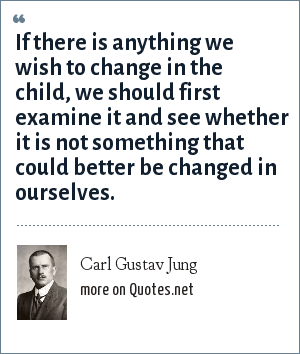 Carl Gustav Jung: If there is anything we wish to change in the child, we should first examine it and see whether it is not something that could better be changed in ourselves. "Carl Gustav Jung Quotes." Quotes.net. STANDS4 LLC, 2019. Web. 24 Apr. 2019. <https://www.quotes.net/quote/14611>.